This morning I met up with several people from the Southeast Michigan Runners(SEMR) Eastside Dirtcrew Run. Amy from the group set up a run for 8am this morning over at Stony Creek Metropark to be running on the West Branch trails. Since Stony is pretty close to me, I thought it would be an excellent opportunity to meet some new runners. In addition, my regular running buddy Trieu was going to be there as well as Josh who I've run with many times before. We started off and before we knew it the hills had started. I've been running back in this area for quite some time but I'm still not quite used to all the turns and twists in there so I still can get lost. Of course, that is part of the fun. Of course, there are well marked signs to get your way back. Amy and Melissa were heading the way for us to start us off. Melissa could only do a few miles with us so we did a loop and got her back to the #1 marker so she could make her way back to the parking lot and the rest of us continued. A few miles after that, my buddy Trieu had to take off as well so he made his way back and the five of us continued on. We got to the top of Mount Sheldon and took a picture of the group. Left to right(Josh, Mark, Amy, Russ) Of course, I took the picture. The black trails(harder) are near the middle of the trails and are lots of fun to run on. Given I've got my first trail full(North Country) in August, I want to run these many, many more time before then. There was a little snow left, as you can see, and there were tons of leaves down so you really needed to watch your footing to not fall. In total, we got in around 6.5 miles on the trails today. After that, Josh and I decided to get in a few more miles. Josh wanted to get some road miles in so we took off out of the parking lot and onto the loop by the lake for an extra 3.5 miles. On the way back, we stopped to get a picture of the creek running by the trail. This is one of my favorite spots in the park in Winter. In my opinion, the creek really looks better in the Winter than the Summer with it partially frozen. 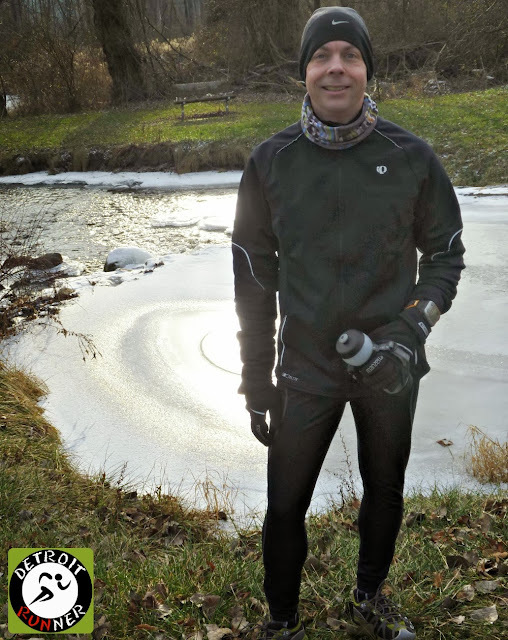 We finished up the run back at the West Branch parking area to complete 10 miles for the day. 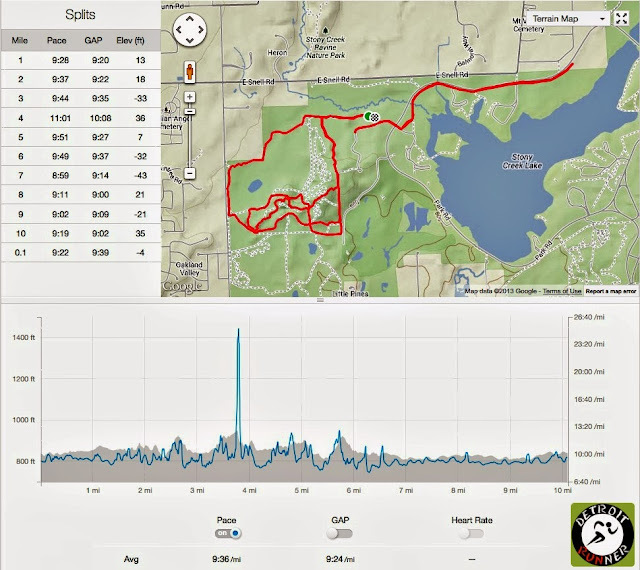 Here's a look at our route, splits and elevation for the entire run. Overall, it was another fun trail/road run over at Stony and I was happy to meet some runners from the Southeast Michigan Running Group. Special thanks to Amy for setting up the run on Southeast Michigan Runners. Now I need to get out onto the West side to run the Poto and various trails out on that side of town with the Westside Dirtcrew. If you're interested in joining one of the SEMR future runs or their group, click HERE to join on Facebook. Looks like a great run!